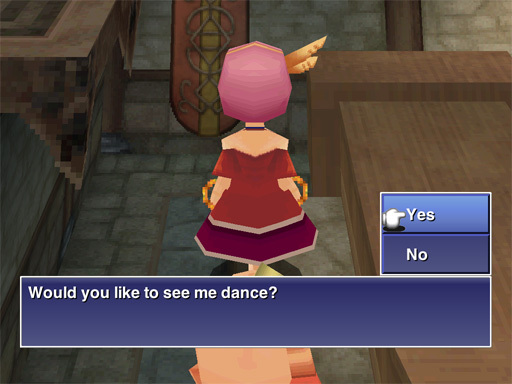 I’m glad that old-school players were able to fall in love with FFIV despite the choppy translation. 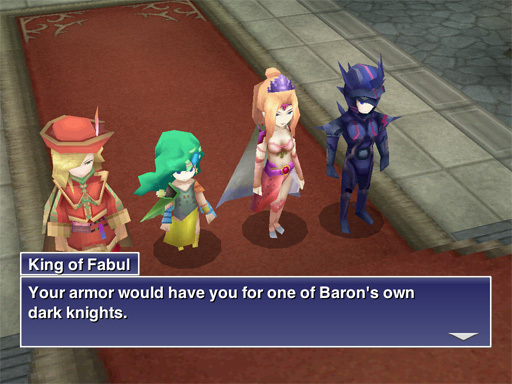 Then again, I adore FFV, even though my version is the uninspired PS1 translation. All right! Let’s go rescue Rosa! In the cave on the way to Dalmasca Damcyan Castle, we meet Tellah, whose family troubles we’ve already heard about from town gossips. Someone needs to cosplay Tellah. I mean, just look at his pants. Stripes and polka dots? And Amano’s concept art for this dude is even wilder. Village scuttlebutt informed us that the prince of Damcyan has a “voice and face as fair as any maiden’s.” I am briefly hopeful that we’ve got ourselves a precursor to Faris. Then I realize that Cecil and Kain have not been fulfilling their obligations as bishie boys, so someone else needs to pick up the slack. 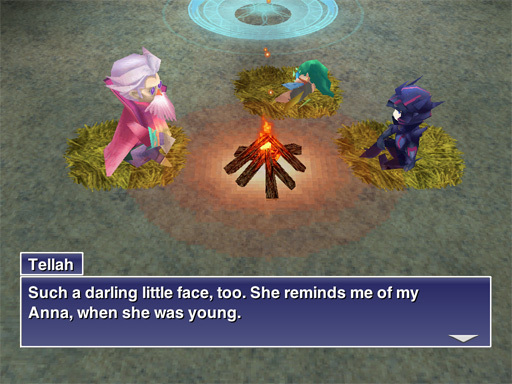 While Tellah appears clueless about the gypsy rover’s identity, he instantly recognizes Rydia as a summoner of some talent. How? Is it the green hair, the scanty costume, or “detailed character sprite, must be important”? Child prodigy or no, Rydia tuckers out after a long day’s dungeon crawl. I approve of Cecil’s worry about dragging a child on such an ordeal (he has no choice, since he can’t leave her unguarded). While she dozes, her elders compare notes about their respective goals: retrieving Anna, rescuing Rosa, watching over wunderkind. 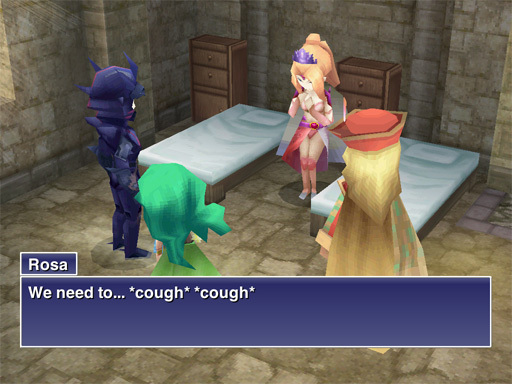 It’s little character moments like this that catapult us from the first phase of FF into its mature phase. 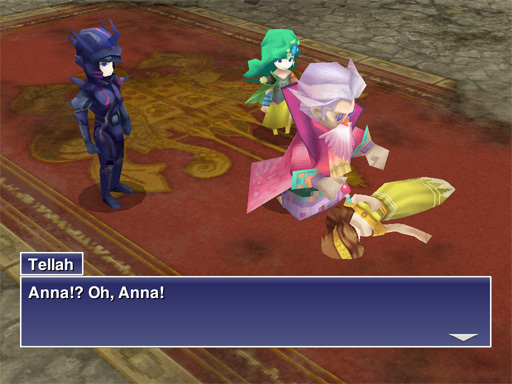 Once she’s back on her feet, Rydia is almost as concerned about Rosa as Cecil is. 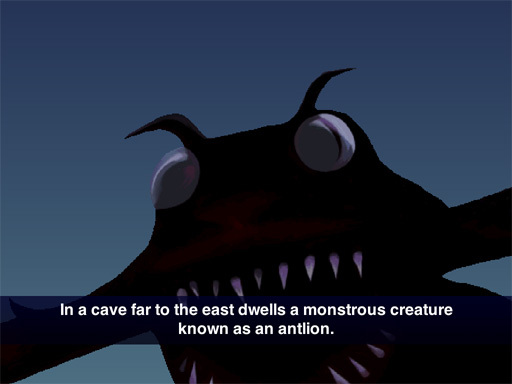 Tellah has warned us that a monster has taken up residence in the next tunnel and prevented him from reaching Damcyan. Cecil is puzzled. I am puzzled why a “cave frequented by men” requires travelers to wade along an underground river, then leap down a fifty foot waterfall. At the bottom of said waterfall (! ), we do battle with a ferociously silly Octomammoth. Some relative of Spongebob Squarepants, perhaps? I finally recall that hey, I’ve got a summoner. 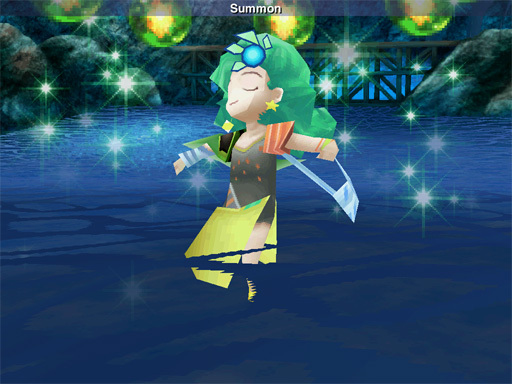 Rydia’s summoning dance is cute. 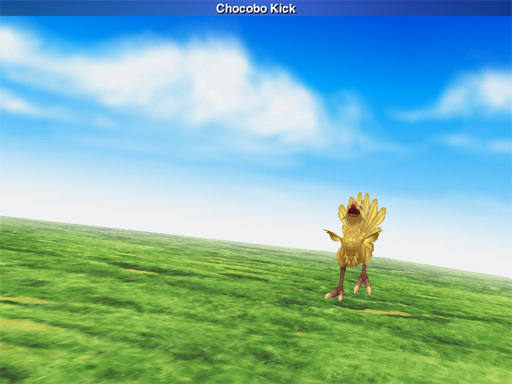 For the moment, all she can summon is Chocobo Kick, the beginning summons in FFIII. 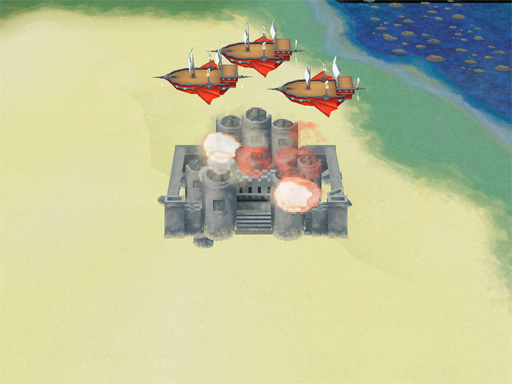 Having punted the Octomammoth, we cross another desert arrive at Damcyan castle just in time to see the Red Wings bomb it. 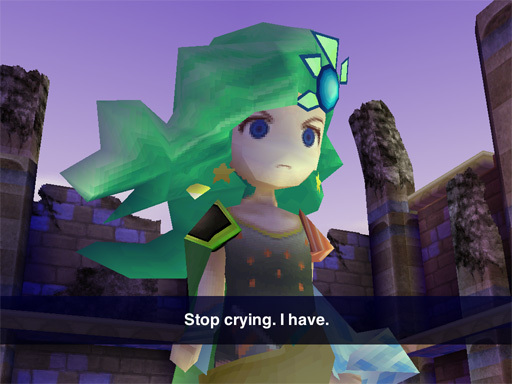 Poor Rydia has to cope with flashbacks. Angst hammer up to eleven in this game. Everyone in the castle is dead or dying. 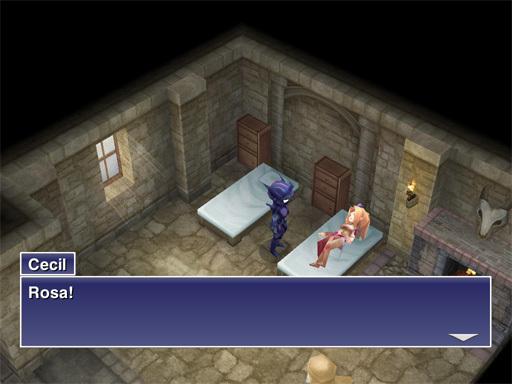 At the top of the castle, we find Tellah’s daughter. 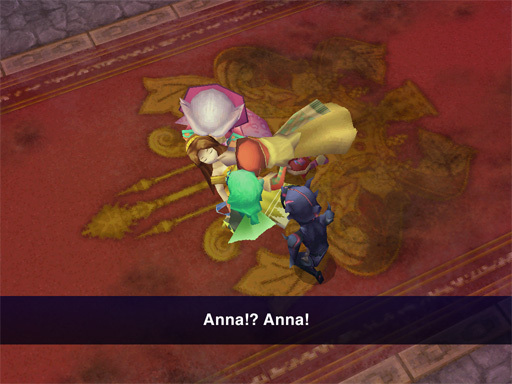 Anna weakly begs them to stop fighting. She reveals Edward’s all-too-obvious secret. This seems to mollify her father somewhat. What, he’ll veto her choice, unless she dates royalty? Tsk. …Anna tells Edward that she loves him and expires. OOPS. 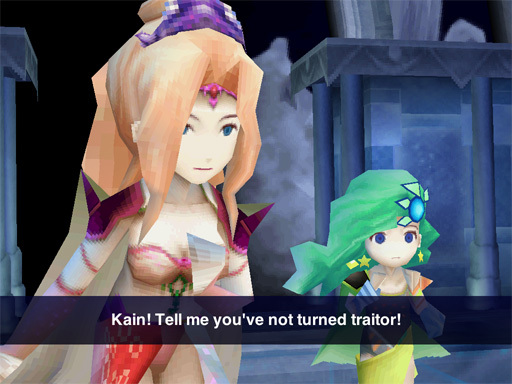 You know, there was a healing urn not fifteen feet away, and my Rydia has a Raise spell. Damn you, gameplay/story segregation! Edward blubbers. Tellah is underwhelmed. 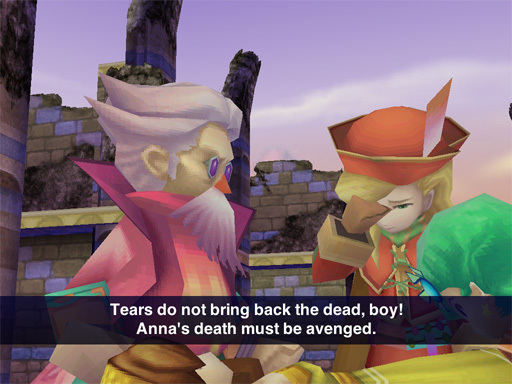 Actually, Pops, Anna would prefer that neither of you get killed avenging her. Edward resumes weeping. 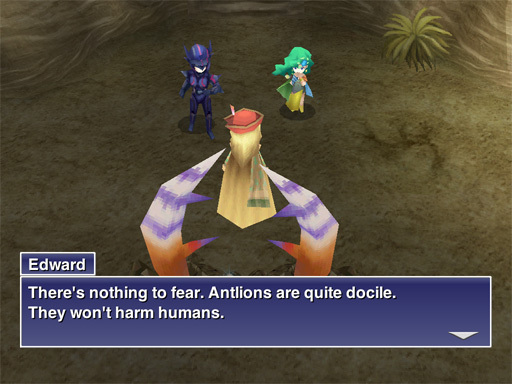 Rydia has a stellar moment of six-year-old badassitude, although someone needs to give her a talking-to about the “act like a man!” part of her rant. 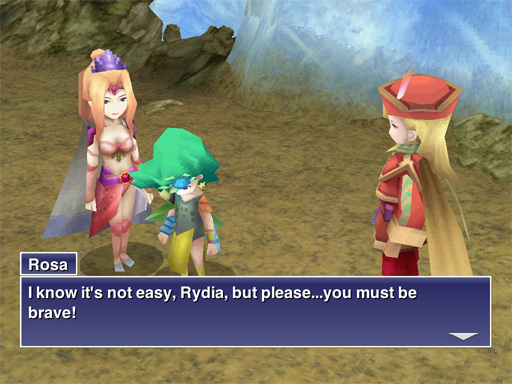 I love Rydia’s frowny face. Cecil interrupts to beg for Edward’s help, explaining that he needs a sand pearl to heal a friend. Recognizing a kindred spirit trying to save his beloved, Edward shakes himself out of his funk and takes them to an Antlion den to retrieve one. We’ll need a hovercraft full of eels to get there. LUKE. I AM YOUR HOVERCRAFT. I… I will take the hovercraft to Mordor, though I do not know the way. You’ll be my living legacy. My honor, my hovercraft…they’re yours now. 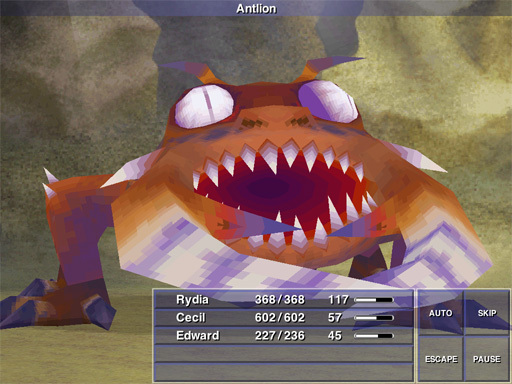 We pummel our way through the Antlion’s den. 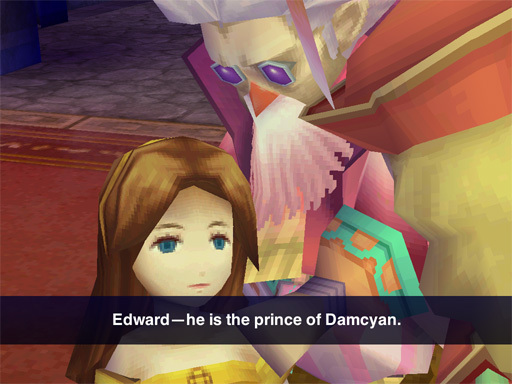 Edward’s just sure we’re gonna get through this without fighting a boss battle. Riiiiiiight. And I’ve got an Excalipur to sell ya. Regardless, we’ve got a distressed damsel to save, so we race back in the... hovercraft. 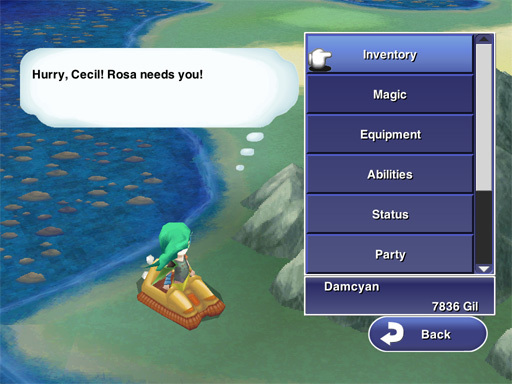 Rydia’s almost as eager as Cecil to reach Rosa. I am once again briefly distracted by the sexual dimorphism of clothing in the kingdom of Baron. Rosa must have a degree in mechanical engineering. 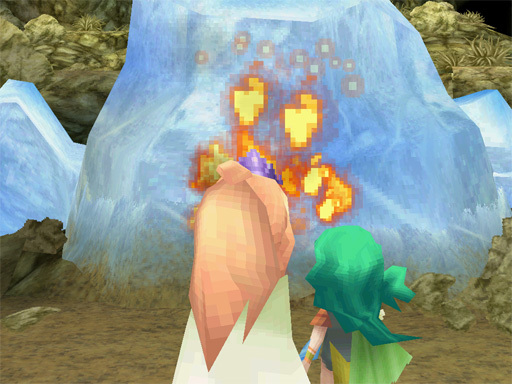 Edward reminds us that the path to Fabul is blocked by a you-can’t-go-there-yet ice wall, but Rosa’s confident that Rydia must have a fire spell to blast through it. 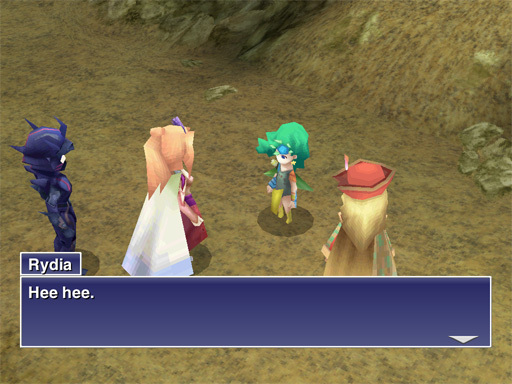 Again, I have to wonder if “Hi, I’m a summoner!” is sewn onto Rydia’s nametag. 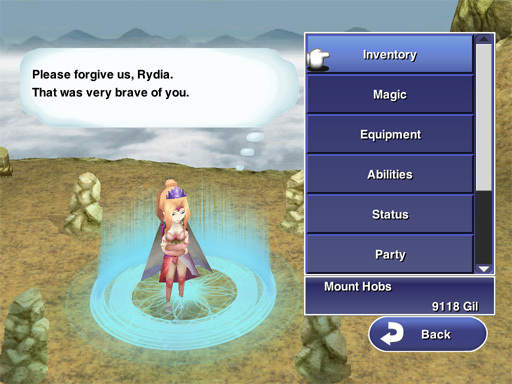 Actually, I can see why Rydia’s abilities are getting telegraphed by every mage/sage who meets her. 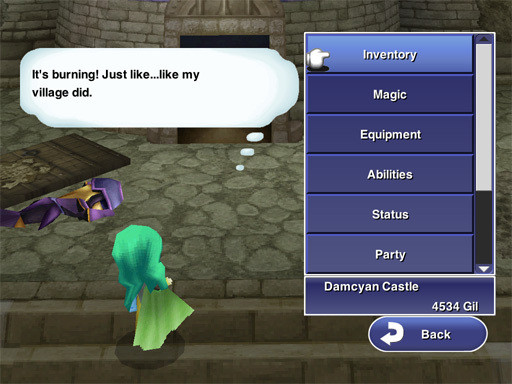 In FFIII, every party member could change job classes at the drop of a hat. (Some of them very silly hats.) 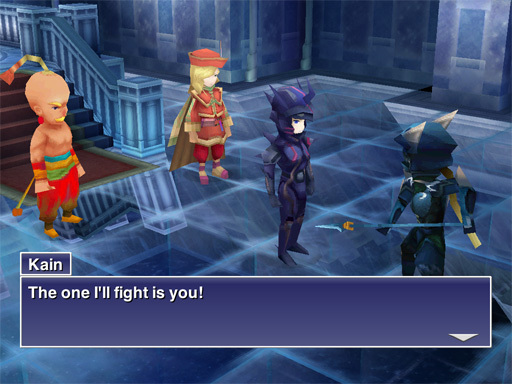 In FFIV, each party member is locked into a particular character class like Dark Knight, Sage, Dragoon, Monk, etc, none of which are the standard D&D character classes familiar to gamers at the time. 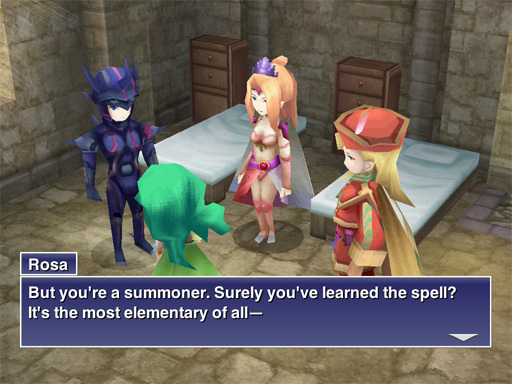 Rather than interrupting the game with out-of-character tutorials, these “Oh, you’re a summoner, so you can do X!” conversations remind the player that Rydia can use summons, white, and black magic. Unfortunately Rosa’s still not feeling entirely well. However, she’s not about to let Cecil leave her behind again. 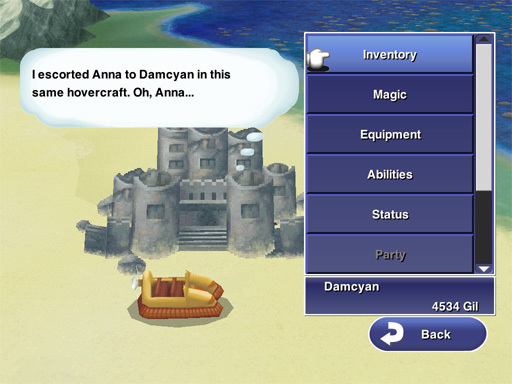 She says a white mage can take care of herself. Sadly not true in every FF, but I’m all for it. 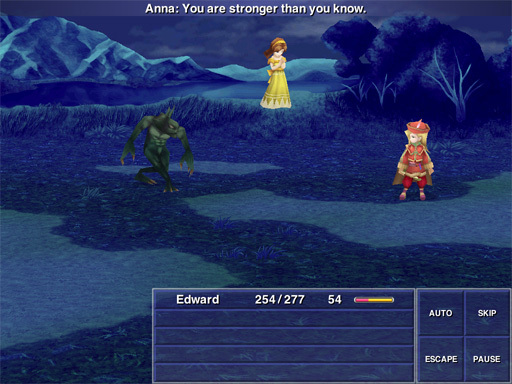 During the night, Edward goes out to mope at the lake, gets a visitation from Anna’s ghost on her way to the Farplane Spirit world, and fights a Sahagin with her urging him on. This is less contrived than it sounds. I’m afraid that despite knowing better, my initial reaction to Edward was, “What a drip!” I didn’t like the fact that Anna had shielded him from arrows and he was apparently hiding instead of tending her when the party first arrives. Yet I will say this: it is a fine thing to have a male character in a fantasy game who is not a warrior and not a Gandalf (i.e. old man = wizard). 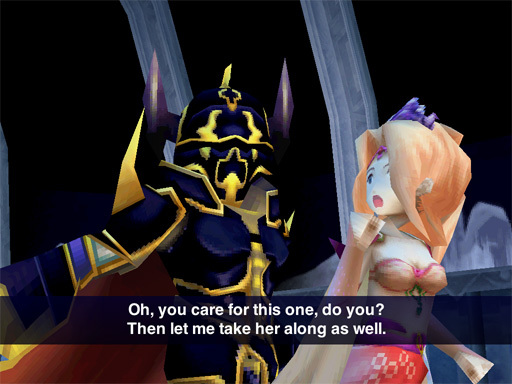 We’ll see whether Spoony lives up to Anna’s expectations and remains a “lover, not a fighter,” or whether he’s put through a Manliness Transformation like Gordon, Prince of Toads in FFII. Next day, we set out for Fabul via Mt. Hobs. 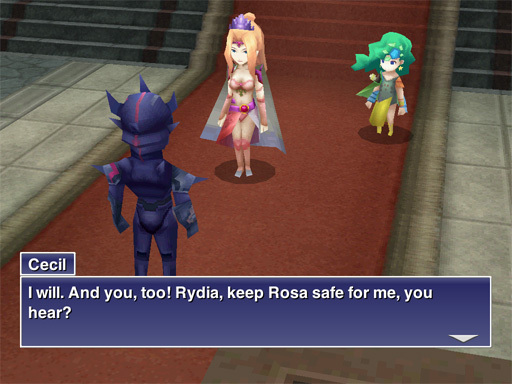 Cecil bleakly informs Rosa what happened to Rydia’s village. 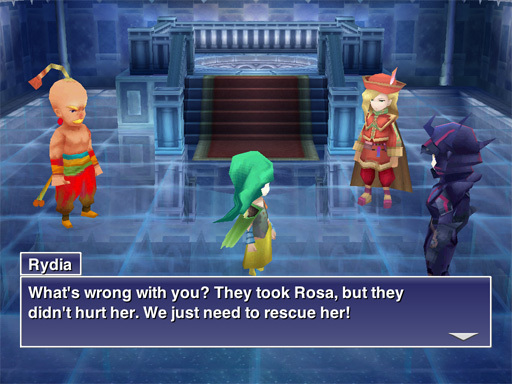 Rosa gently coaxes her, saying they won’t make her do it, but it will help them save others from being hurt. I really love the dynamic of an older woman/mage mentoring a younger, with respect and love. Bechdel Test, check. This sequence is what inspired my doodle/portrait of Rosa & Rydia. Moving on, I just gotta say. WHITE MAGE WITH BOW. WHY IS THIS NOT A THING MORE OFTEN. At the top of the mountain, we find a monk beating the stuffing out of a mob of goblins. However, a Mom Bomb (whut?) causes him more trouble. Rydia to the rescue! 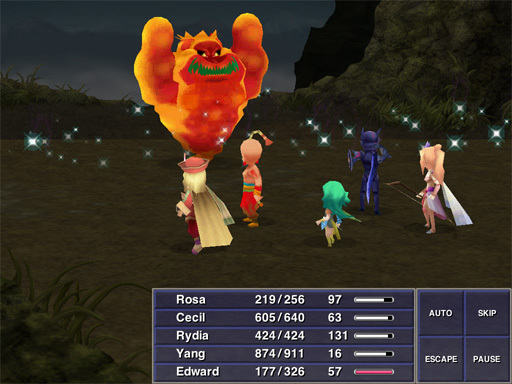 Halfway through the battle, Mom Bomb displays one of the odder transformations in FF, and spawns a bunch more bombs that pound us pretty badly before we defeat the whole mess. He relates how all his monks were killed by a huge host of monsters; he’s the sole survivor. 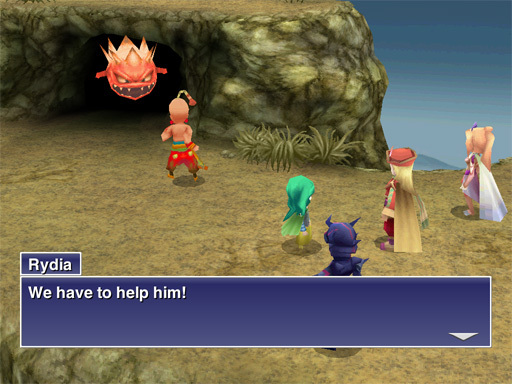 Rosa guesses that Golbez sent the monsters to draw out and destroy Fabul’s defenses before moving in to seize their Wind Crystal. 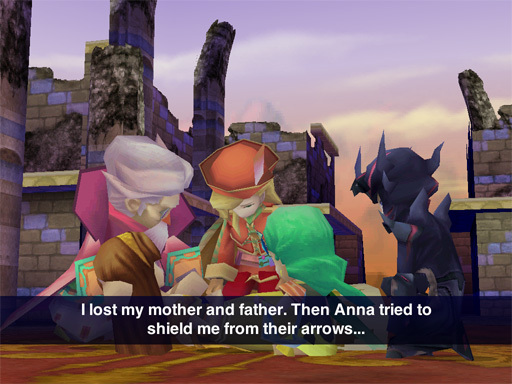 Yang is reluctant to accept more aid, until Cecil explains that everyone in the party has personal reasons for fighting Baron. She thanks them, then shoos them off to see the king. But wait! 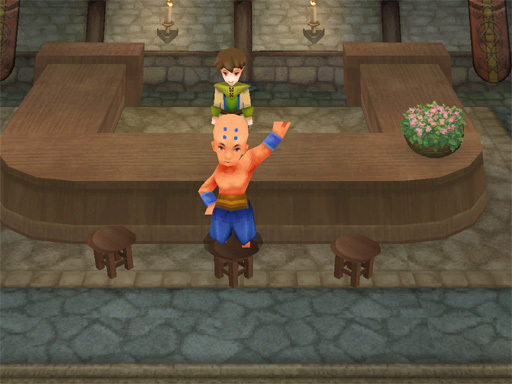 We have to talk to all the npcs in the castle, first! 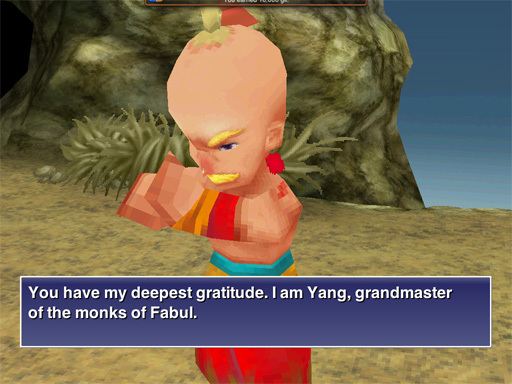 Most are your run-of-the-mill monks looking up to “Master Yang,” with a few white mages thrown in. Then… oh no, it’s another one of those WTF dancers who’s gonna rip off her dress and shimmy, isn’t it? She’s a he. It’s a monk in drag. I think I’ve just been trolled. 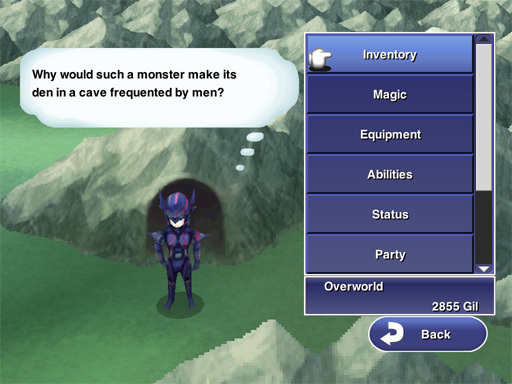 Well played, FF, well played. 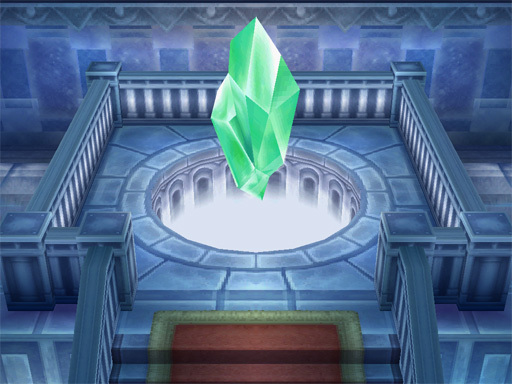 Rydia is probably bursting with impatience at this point, so we’d better head up to the throne room. 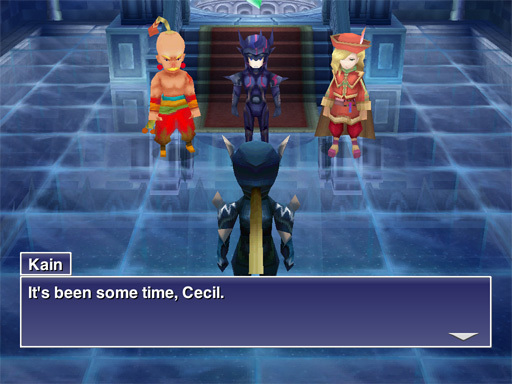 At first, the king is none too inclined to trust Cecil and company, despite Yang’s favorable report. Edward’s glib tongue comes to the rescue. 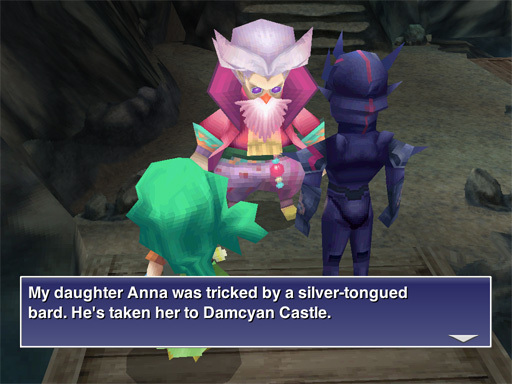 The prince grimly tells the fate of Damcyan, his parents, his lover and the fire crystal that was taken from his own castle. The king of Fabul is convinced. 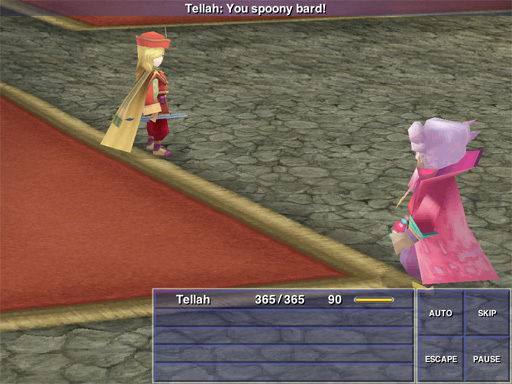 (Go Spoony!) 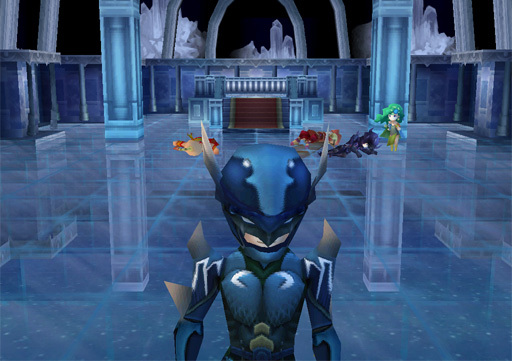 Trusting Yang’s judgment, the king puts his faith in Cecil and friends help defend Fabul against the imminent attack. 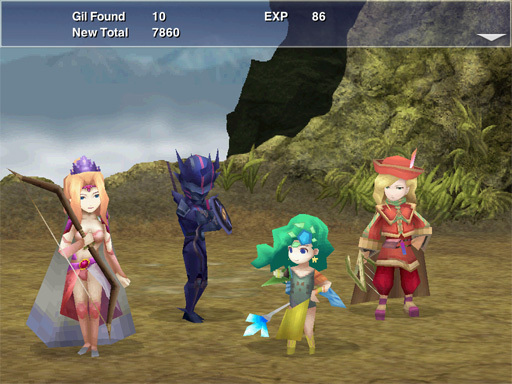 At this point the party separates, with Rosa and Rydia joining the castle healers. Grumble feh. 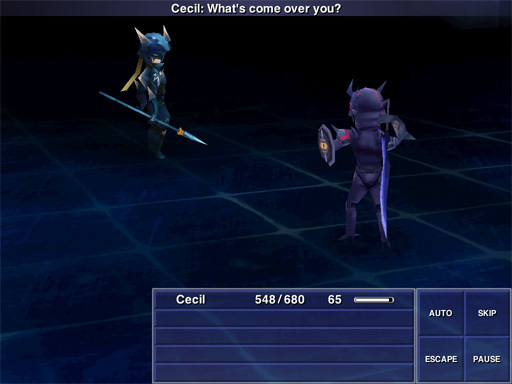 Rosa calls Cecil back to tell him, “Be careful,” as she did near the beginning of the game. Okay, I’m slightly mollified by the respect both of them give Rydia’s abilities. 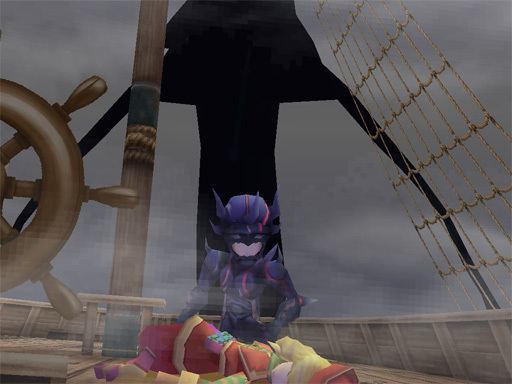 The next scene is really quite dramatic, like the siege of Balamb Garden in FFVIII. 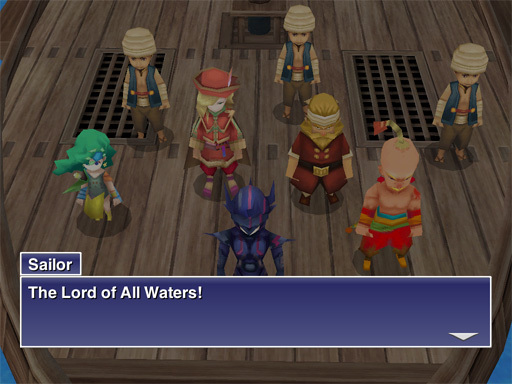 With only Spoony, Cecil, Yang, and a bunch of monk trainees, we are seriously outnumbered. Yang fights using a collapsing line tactic, but all it does is delay the inevitable. It doesn’t help that one of the monsters disguises himself as a monk and unbars the doors as Yang retreats into the citadel. What? Just a dang second. 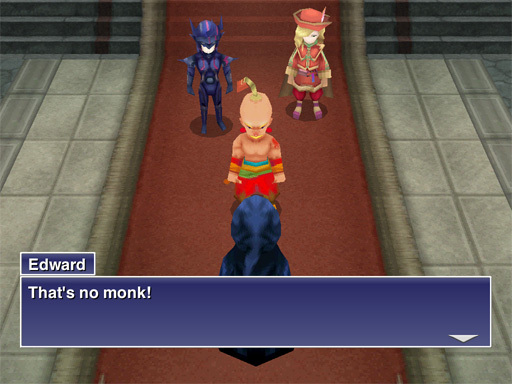 First this spy was a bald, shirtless Fabul monk, then it’s a hooded figure, and then its battle form is a gargoyle— are we back to random FFIII shapeshifting? 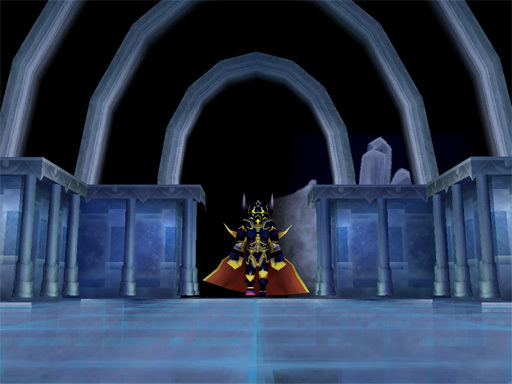 We’re pushed all the way back to the crystal’s inner sanctum. 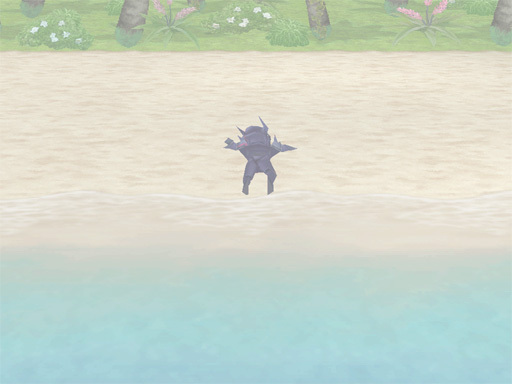 An old friend arrives for a showdown. Cecil’s overjoyed to find Kain’s alive— there was a “Kain, I wish you were here” thought balloon just a short time ago— and thinks he’s come to help defend Fabul. Um, no. Cecil is surprised. 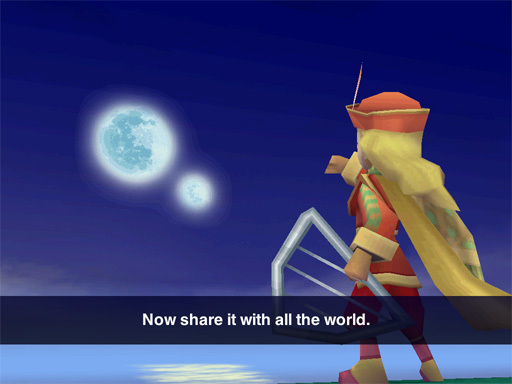 Didn’t they vow to fight Baron together after torching Rydia’s village? News flash to Cecil: Sweetie, his name is KAIN. The cavalry comes charging in. Kain flinches at Rosa’s voice. He seems to be struggling with some kind of mind control. 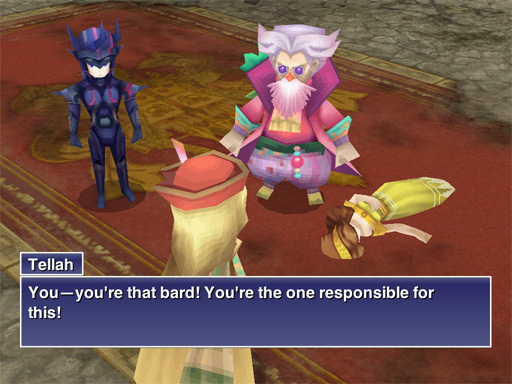 Cecil shouts at Golbez the usurper, unwisely drawing attention to himself when he’s already on the floor. 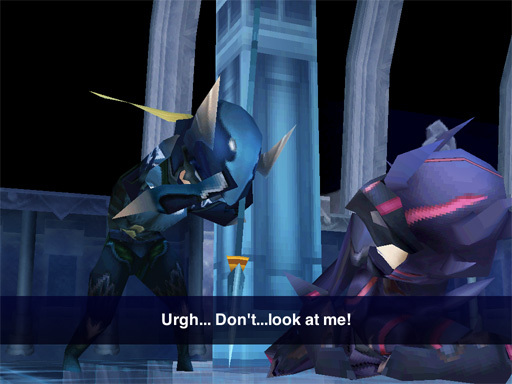 Golbez does… something… to him. Cecil collapses again. This is going to be inconvenient later, isn’t it? 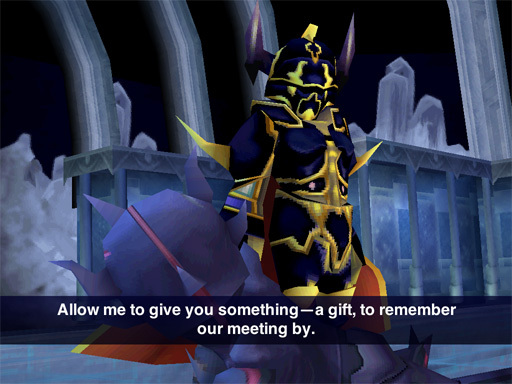 “Hand me the Black Materia” inconvenient, right? 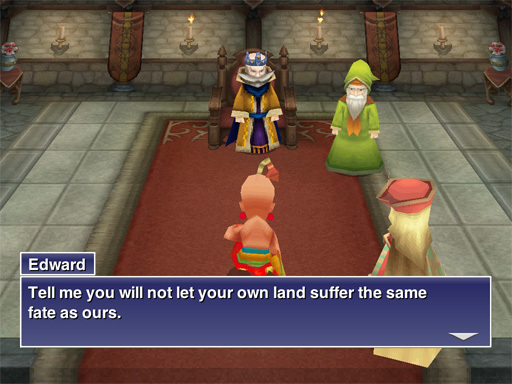 Golbez blasts Edward and Yang as “worms,” reasserts control over Kain and orders him to seize the crystal over Rosa’s protests. Unfortunately, Cecil’s feeble attempt to reach Rosa backfires. DAMMIT. Rosa gets hauled off into the Distressed Damsel penalty box. 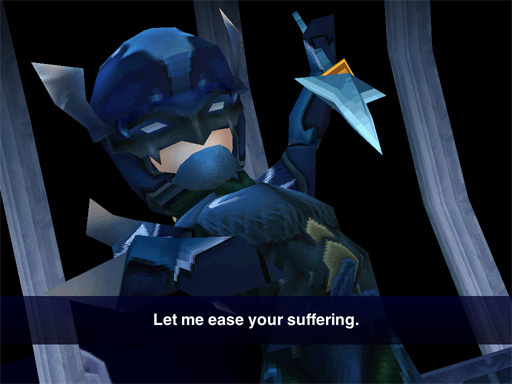 Gimme back my white mage archer! Kain perfects his Grim Stalk of Doomy Doom. 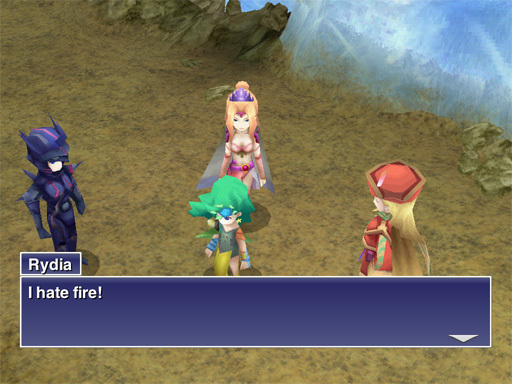 Once our antagonists have cleared out, Rydia casts a cure spell to revive everyone. She won’t let them stand around moping over what just happened. We check on the castle, since we’re not really sure how to rescue Rosa yet. Most people are pretty beat up — the king himself is wounded, and a white mage poignantly remarks, “Would that I had magic to equal Lady Rosa’s” — but one person, at least, has come through unscathed. 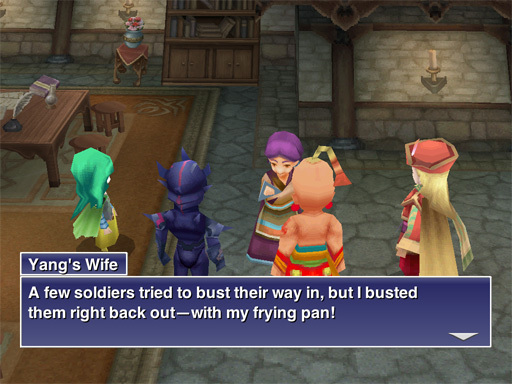 In fact, she gives Yang the frying pan (i.e. “Counter Argument” skill) as a parting gift when we go off to rescue Rosa. 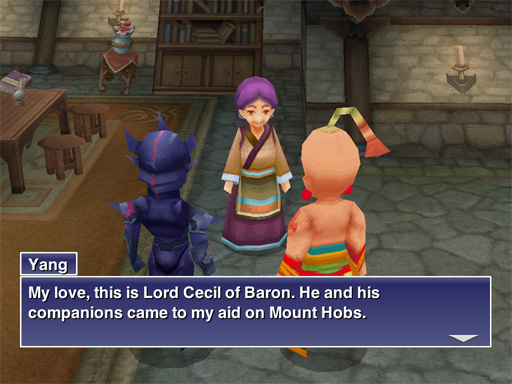 The King of Fabul provides Cecil and his friends with a ship to reach Baron. Unfortunately, it’s too early for the endgame, so Leviathan butts in. 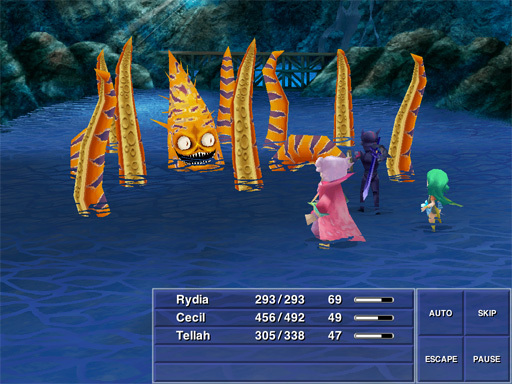 The remake throws in some clever visual quotes of Final Fantasy X, the scene of Sin attacking Yuna’s ferry. Random sailors tumble across the deck like the Aurochs. 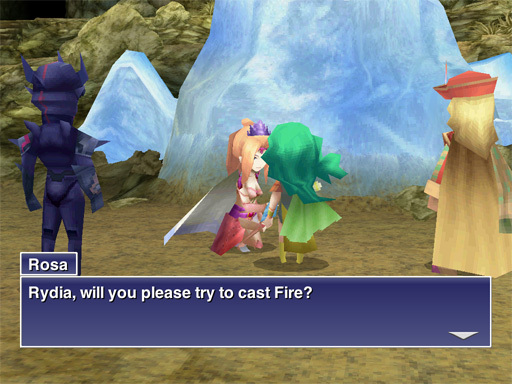 Poor Rydia doesn’t have a big blue furry guy to grab her! 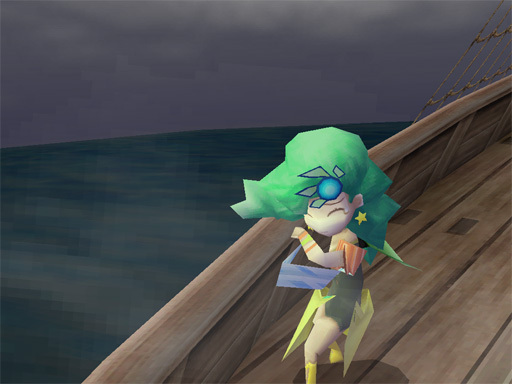 Yang imitates Wakka, diving off the ship when she’s washed overboard, but it’s too late. And we have a fade to white. When Cecil wakes up, he’s in another place. So! That was exciting. 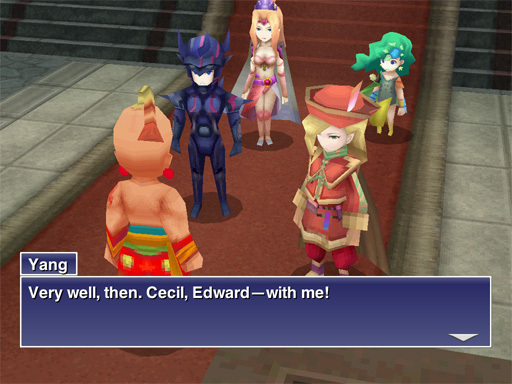 Tune in next time for Cecil’s Humiliation Conga! 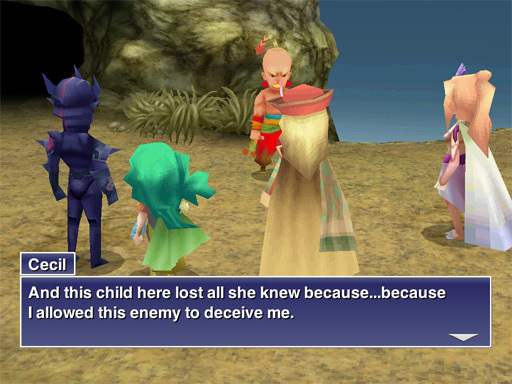 This entry was posted in Final Fantasy IV, Let's Play... and tagged bechdel, better with monks, curse your sudden betrayal, distressed damsel, ffiv, magic meta, mentor, old kook, shipwreck, where'd everybody go. Bookmark the permalink.